I had been wearing a brace for my ankle, but it is rubbing a blister on the back of my heel. It is a great big thing...and rather than continue with the brace, I downgraded to an Ace bandage. Those sure have changed over the years. I used to wear one on my wrist, and I had little elastic claws to grip it closed. Now they are sticky, so it adheres to itself. This has also happened, as I finished using one half of the poncho on the Princess's sweater. I think this will be a pair for Christmas. The colors are a little girly, so it will be probably for my SIL. 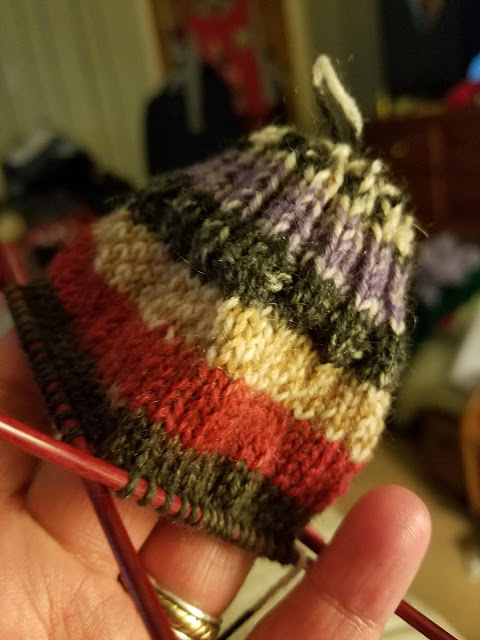 It is self-striping, so no pattern necessary. That means it goes fast. What are you working on?